This movie came out in 2008, and to the present, I and my family are the only ones I know who have seen it. I didn’t save this flick for last because it is the best movie among the ten. It isn’t. That distinction would have to go to either The Travelling Circus of Dr. Lao or The Iron Giant. I think I saved it for last because it is the most obscure. It has some strong performances, especially by Tim Robbins and a very young Saoirse Ronan before she became a hot property in Redemption. Ember is a city that was built underground to preserve a portion of the human race from some unmentioned apocalypse. Everything about the environment is artificial. The night sky, with which you are greeted at the opening of the film, is nothing more than a collection of electric lights suspended oer the city and one of which burns out and falls with a great racket to the streets far below. It is a warning that things are beginning to run down in Ember. As the story progresses, we learn that the sojourn underground has lasted nearly twice as long as the city’s founders intended, and all of the life support systems on which the Emberites depend are more than a little threadbare. 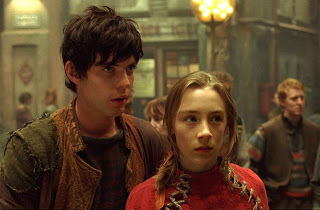 As far as the spectrum between parable and myth goes, City Of Ember falls leadenly into the parable category. Here is a world where everything is running out. You can go to any warehouse and request canned goods, but anything except turnip greens and refried beans are in short supply. There are frequent blackouts due to the testiness of the aging dynamo at the city’s core, and the residents seem not to notice. They are lulled to sleep by official pronouncements of how good it is they have it in Ember, and pull the comfort blanket of Singing Day [a very thinly veiled swipe at religion] around them when things get difficult. Of course, two Plucky Youngsters™ discover The Truth, and most of the dramatic tension in the movie results from their desperate attempt to escape the doomed city and from the obstacles placed in their way by others who know the truth but hav a vested interested in maintaining the status quo, even though it means extinction for everyone. Of course the Plucky Youngsters™ succeed intheir Quest, and are amply rewarded by the Grandmother of All Light Shows. I’ll leave it at that. Recently I saw another very good Korean Sci-Fi flick, The Doomsday Book, in which a Buddhist robot attains enlightenment. It’s on Netflix streaming. Seek it out as well. Reddit Fantasy More discussions here than almost anywhere. Thank you for the good list. I recently saw 7 Faces of Dr. Lao with Tony Randall!! of all people as Dr. Lao (and all his manifestations). Think it was on TCM. It was odd and delightful. I saw Enemy Mine years ago, still a good film and scratches my sci-fi itch. I am an classic movie buff so I will check out the rest of the list.